Saint Juliana Falconieri was born in 1270, in answer to prayer. Her father was the builder of the splendid church of the Annunziata in Florence, while her uncle, Saint Alexis Falconieri, became one of the seven Founders of the Servite Order. Under his surveillance Juliana grew up more like an angel than a human being, as he said. Her great modesty was remarkable; never during her entire lifetime did she look at her reflection in a mirror. The mere mention of sin made her shudder and tremble, and once, on hearing of a scandal, she fainted. Her devotion to the sorrows of Our Lady drew her to the Servants of Mary or Servite Order, and at the age of fourteen, after refusing an offer of marriage, she received the habit from Saint Philip Benizi, General of the Order. Her sanctity attracted many novices, for whose direction she was bidden to draw up a rule, and thus she became foundress of the Mantellate. She was the servant of her Sisters rather than their mistress, while outside her convent she led a life of apostolic charity, converting sinners, reconciling enemies, and healing the sick. She was sometimes rapt for whole days in ecstasy, and her prayers saved the Servite Order when it was in danger of being suppressed. Saint Juliana in her old age suffered various painful illnesses. She was wasting away through a disease of the stomach which prevented her taking food, and bore her silent agony with constant cheerfulness, grieving only for the privation of Holy Communion. At last, when in her seventieth year she was at the point of death, she begged to be allowed once more to see and adore the Blessed Sacrament. It was brought to her cell and reverently laid on a corporal, which was placed over her heart. At this moment she expired, and the Sacred Host disappeared. After her death the form of the Host was found stamped upon her heart, at the exact spot over which the Blessed Sacrament had been placed. 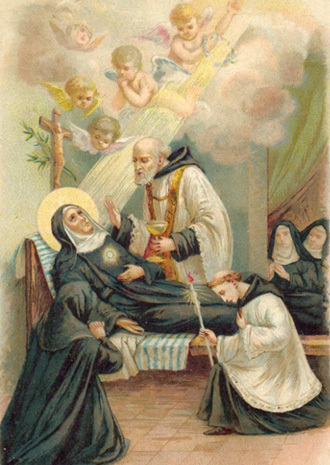 Saint Juliana died in her convent in Florence in 1340. Miracles have been frequently effected through her intercession. Reflection. Meditate often, says Saint Paul of the Cross, on the sorrows of the Blessed Mother, sorrows inseparable from those of Her beloved Son. If you seek the Cross, there you will find the Mother; and where the Mother is, there also is the Son.